The 2016 Washington Automotive Press Association Rally. The Chesapeake Bay Beach Club. Over 50 new vehicles. More than 150 journalists. Four approved routes. And a few rules. #1. Be courteous, both to the vehicles and to our fellow journalists. Maybe that’s two. #2 Stay on the pavement. And a few others we forgot right away. So we jumped in the 2017 Subaru Forester XT Touring and took off. As we drove along the approved route we saw a huge housing project under construction with bulldozers, huge cement sewer pipes laying around and a lot of dirt and mud. Charlie slowed down and flipped a u-turn. I got a little nervous and reminded Charlie of the “stay on the pavement” and the “be courteous” rules (the only two I could remember). Charlie said the “pavement rule” only applied to the grounds of the Beach Club and he dismissed the “be courteous rule” with a wave of his hand. I wasn’t so sure. So onto the hard packed dirt road we went, into the construction site. We went deep into the site. Past the earth movers. Past the cement pipes. We stopped and Charlie jumped out of the Subie and surveyed the field. Reluctantly, slowly, I got out and walked up next to him. In front of us was a mud field. That’s the only way to describe it. This was construction mud. This was sewer mud. It was deep. It was thick. It was wet. And it stunk. There were some deep tracks in it where a large construction truck had been and that was about it. Conservatively, I would say it was 10-16 inches deep. I said there’s no way we are going through that. No way!! We won’t make it! Charlie said get in, I’m going to show you how capable these Subaru Foresters are. I was pretty hesitant. I’ve been driving the Roadfly Black Bear Jeep Wrangler that we’ve been building and thought that that’s what we needed here. 4.5 suspension inch lift. 37-inch tires. And a winch in case we get stuck. That’s what I wanted right then – not a Subaru Forester. This has street tires on it I said. You can’t hit that mud with street tires. There’s no lift. There’s no big tires. And no winch. There’s no way. We’re going to get stuck and look like idiots. Charlie told me to quit my whining and to get in. I didn’t want to have anything to do with this. But Charlie had the keys and I didn’t want to walk. So I got in. Hesitantly. Slowly. We got back in the Forester and Charlie hit the gas and we hit the mud. Head on. It was so deep we didn’t even have front-end clearance. I knew it, I said. We’re screwed. But the Forester plowed right through the mud like a snowplow. Like a hot knife through butter. Charlie expertly made the first pass and mud was flying everywhere. Then as he made the first turn mud started flying into the cabin – I had left my window down. Whoops. Rookie mistake After remedying that quickly Charlie went for a second pass. Wheels spun. Mud flew. And we plowed through it a second time. I told Charlie we better quit before we really got stuck. So Charlie made two more passes just to prove me wrong and it was like we were driving on dry pavement. We weren’t even close to getting stuck. Not even close. I’ll admit I was really surprised. I thought we would get stuck or at least mired down a little. We might have to rock it back and forth. Maybe I’d have to get out and push. But we barley even slowed down. Charlie finished his last pass and we hit the hardpack and headed back to the Beach Club. Mud was flying in every direction all the way back. When we reached the parking lot and got out, the Forester was completely covered in mud. The front grill was so stuffed with mud that after we parked huge clumps kept falling off. The other journalists that were standing around when we pulled in looked over with jaws dropped. I guess they have never test driven a Subaru Forester XT Touring before. 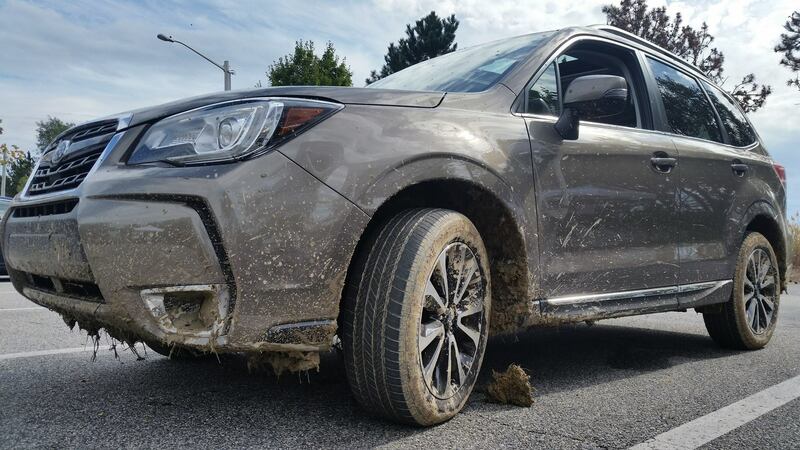 I may have had my doubts about Subaru’s off-road capability before, but now I’m a convert. The Forester XT is one seriously off-road capable vehicle. All I can say is next year I’m driving the Subaru and I’m going to be looking for deeper mud! !